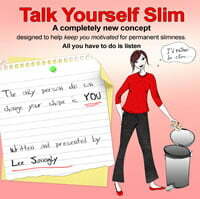 Now available – The essential Talk Yourself Slim CD by Lee Janogly – a completely new concept designed to keep you motivated for permanent slimness. Lee developed this CD in response to requests from her ‘Living Slim’ diet clients, but it is now available to everyone who wants help to keep on track with a diet plan. When you start a diet you are highly motivated so it is easy to resist fattening food. But what happens three weeks – or three months – later when boredom sets in and you get a craving for chocolate or crisps? As Lee explains, losing weight is so much to do with the thoughts in your head that determine what you eat. So – get your thoughts right and your body will follow. It isn’t easy to overcome that persistent negative voice that says it’s OK to grab that cream cake. But what you really want to hear is the positive, constructive voice reinforcing that it’s more important to you to be slim than eat junk. The only person who can change your shape is YOU. So essentially, this CD represents YOUR voice talking to YOURSELF – saying what you need to hear to keep you motivated and help you stick to your healthy eating plan. You can use this CD on its own or to supplement your chosen method of weight loss. All you have to do is listen – any time and anywhere. YOU CAN DO THIS! Prepare to live the rest of your life as a slim person. To buy this CD, please visit our Online shop.